SG System Products Ltd can remove the old balustrade, fit temporary balustrade in its place, and refurbish / re-sleeve the old balustrade in our workshop before re-fitting. It can be sleeved in the same colour to “freshen up” the appearance, or alternatively, re-sleeved in a different colour to match a new colour scheme. Infill panels can also be replaced if required. An example of this is shown in the photographs. The photographs of the white Stargard balustrade were taken in February 2016 and show an absolute minimum of wear on the balustrade which was installed in 1998 (18 years ago). The balustrade has not required any maintenance other than day to day cleaning throughout this time. The staircase is located in a heavy traffic area of some council offices. The council decided to refurbish and “freshen up” the staircase and the next photographs show the same balustrade in our workshop waiting to be re-sleeved. The overall timescale for this refurbishment is around two weeks from removal to re-installation and is much more cost effective than renewing the whole balustrade. 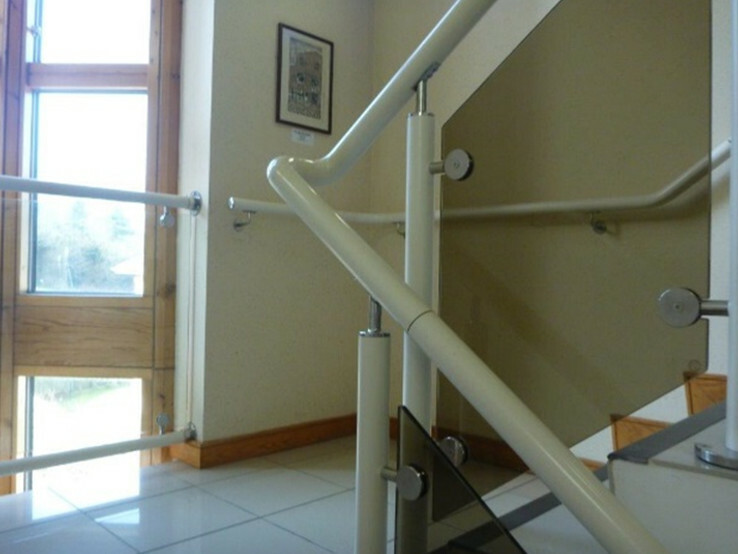 For more information look at our Stargard Warm to Touch Handrail dedicated page!